For a change we had some spare time during our mission so it was decided that we would go on a short tour of the Xinjiang desert south of Urumqi. There was myself, Fei Deng and her husband Kurt, as well as Jean-Marie Braun. We were joined by several people from the project office who would be our hosts for the trip. 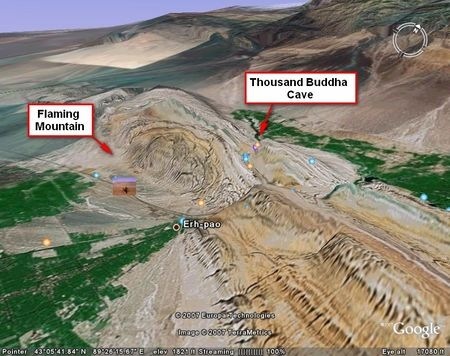 The plan was to drive to the ‘Flaming Mountains’ and then to the ‘Cave of the Thousand Buddhas’. 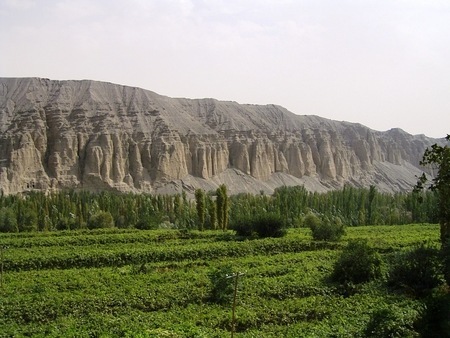 We would then visit the ‘Gaochang Ruins’ and the ‘Grape Valley’ before the others would head back to Urumqi. I would spend the night in Turpan before catching the bus back the following morning. We drove south from Urumqi to Flaming Mountains’ which is shown on the Google Earth image below. 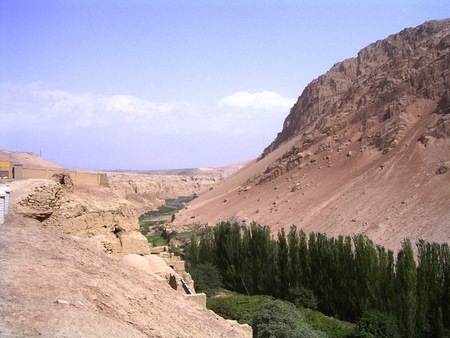 The mountains are 98 km long, 9 km wide, and cross the Tarin Basin west to east. It is a popular tourist stop for two reasons. In a classic chinese novel from the Ming Dynasty (about 650 years ago) the Monkey King stirred up trouble in heaving and kicked over the oven for making immortal pills. Charcoals fell from the sky to where the Flaming Mountain now lies in the Turpan Basin. That gives rise to the second reason: it is the hottest place in China. They have a huge thermometer at the tourist centre and, if it is to believed, even though it was mid-September the temperature was 49 degrees centigrade. One of the men with us told us that it gets so hot there shoes can melt to the road. I was a bit skeptical, but I can say that it felt like a blast furnace. The tourist centre was built partially underground in a circular fashion, with the thermometer at the middle. They had statues of famous people including people like Sir Aurel Stern and Sven Heiden who had explored this area a hundred years ago and taken many artifacts back to the west. Years ago I had read a fascinating book on it by Peter Hopkirk entitled ‘Foreign Devils on the Silk Road’ and I never thought that I would one day find myself retracing their footsteps. We went out from the centre and stood in the desert. They had camels there for tourists to get their photos taken on. Fei obliged and the photo below is of her and her husband Kurt. I just had my photo taken with one as a backdrop. 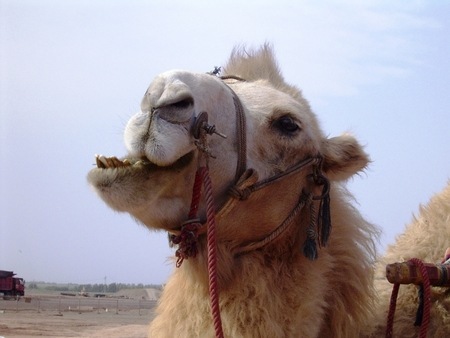 The camels one finds in the Gobi Desert area of China have two humps instead of the more common single hump camels one finds in India and the middle East. Called Bactrians, they are amazing animals with their large (often floppy) humps and their big padded feet. Apparently, they have two coats: an inner coat of down and their rough, long hairy outer coat. They are well adapted to the heat and cold of the desert – and the lack of water: they can drink 120 litres of water at a time! They also have very bad teeth as you can see from the photo below. 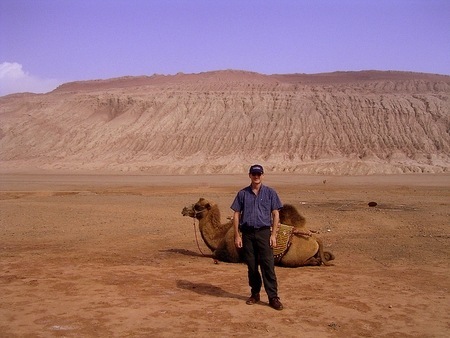 Lis, who loves camels, would have enjoyed the experience. From there is was over to the ‘Caves of the Thousand Buddhas’, which was a series of grottos along the river to the other side of the mountain where we were standing. It was amazing to travel through the parched desert and then come across this river with green trees growing along the banks. The area was a way station for buddhist pilgrims travelling to India from the 4th – 14th centuries. Local monks lived in the caves they had carved from the cliffs as part of their austere life. 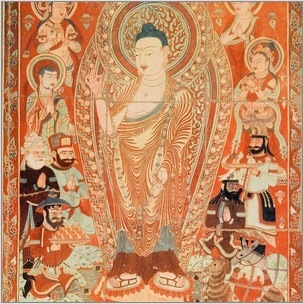 Murals were painted in the caves to help with meditation. The monks collected scriptures and these were eventually stored (some say thrown away) in caves that were walled off in the 11th century. In the early 1900s a local Taoist priest found this store of scrolls which included not only Tibetan buddhist scripture, but even nestorian Christian works. When news got out this attracted foreigners (as described in Peter Hopkirk’s book) who took a great number of scriptures away with them. The worst visitor was Albert von Le Coq. He took a liking to the murals on the cave walls so proceeded to cut off some 360 kg of artifacts, wall-carvings and precious icons. When we visited the site we could see the saw marks his people left in the parts of the walls where they did not remove panels. They were very spectacular – as the photo below which is from one of his books shows. Unfortunately, they were all destroyed in World War II when the British bombed Berlin. However, those that remained have not fared well over the years. I recall the story from Hopkirk’s book both Chinese soldiers and Russian prisoners (White Russians who fled to China after losing out to the Communists in the civil war) were housed in the caves. They defaced the paintings and many had the faces of the buddhas scratched off. We could see Chinese names scratched in the paintings – some of which were less than 10 years old. The Chinese had installed clear plexiglass to protect the paintings now, but overall the preservation of such a historical place was well below what it should be. I wonder what it was like for the caves we were not allowed to visit! We then travelled to Gaochang City – or what was left of it. This was a garrison town bult about the first century B.C. It grew into a huge city with a 12 m high walled perimeter of over 5 km. Today it is nothing but an empty, dry wasteland of ruins. We took a donkey drawn cart along the bouncing road and admired the ruis. They were doing some restorations, so it was difficult to tell what was new and old in some places. From here it was time for lunch – and the world of contrast. We went to the ‘Grape Valley’. This an area of some 1000 acres with grape vineyards. It is an amazing green oasis with grapes running as far as the eye can see. We descended down to the ‘restaurant’ area, past vendors selling colorful dried fruit and nuts. 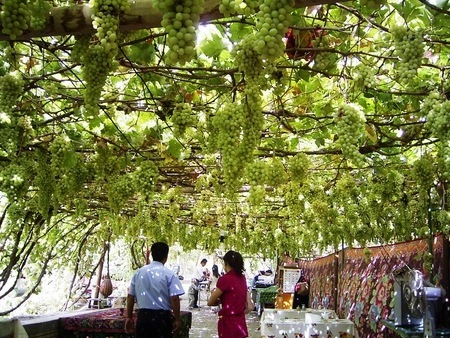 The restaurant was basically a set of tables under a series of trellises with grapes hanging down. Hungry? Just reach up and grab some grapes. It was truly an exceptional place to dine. Unfortunately, vegetarian food proved to be a challenge, but I didn’t mind given the ambiance. Although we were in the desert, it actually started to rain. We went for a walk around the area which included a visit to a museum to a famous Chinese folk musician. It covered all aspects of his life, especially the way that he was first arrested by the Nationalists and then the Communists. Hard to please everyone isn’t it? He spent many years in prison but in his later life was ‘rehabilitated’. From there it was see the ‘Karez irrigation system’. This is one of the most amazing engineering feats, and what is suprising is how few people (including myself) had heard of them. 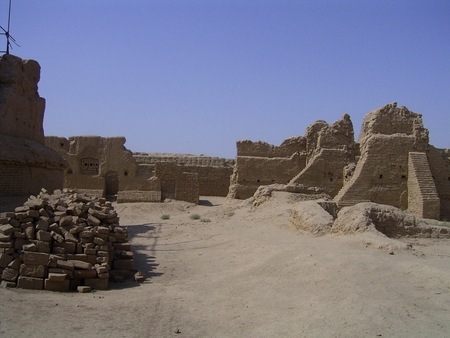 The basic problem was that the town of Turpan was short of water so the logical thing to do was to dig a well and find water. What was unusual is that the wells were dug up to 30 km from the city, and they were then connected with underground tunnels. 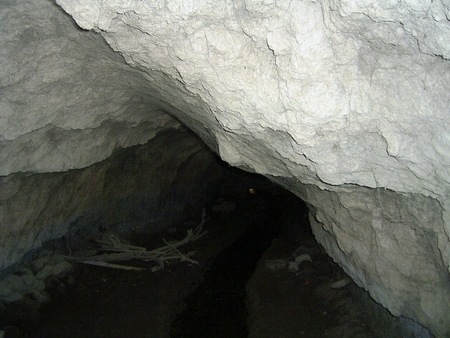 Thus, we had a karez which are basically underground canals. These are found not only in Xinjiang–where there were over 5,000 km–but also Iran and the Sahara. The oldes karez dated back to 100 B.C. and some are still working today. We were able visit a museum and then walk along one of the Karez’s. Obviously, being underground greatly reduces evaporation, it also prevents them from pollution. The vertical wells were dug for access and also for maintenance. The deepest were some 100 m. I wondered how it was that someone could mobilize people to do this. Imagine, telling people to dig 100 m deep wells every, say, 50 m, and then connect them with tunnels to bring water 30 km. They would be committed today. At the museum they showed how they got them dug in a straight line: two weighted ropes with a piece of wood between them at the top and bottom. Great engineers these Chinese! It had been a long day and it was time for the others to return to Urumqi. I was taken to Turpan where I stayed at the ‘Grand Turpan Hotel’. It wasn’t so grand. I went for a walk in the evening around town where it seemed I was the only foreigner. It was fun to see people going about their evening shopping in the market, the kids roller blading under trellises with – no surprise – more grapes. The only disconcerting aspect to the evening was the wind which was VERY strong blowing dust everywhere, kind of like minor sand blasting. 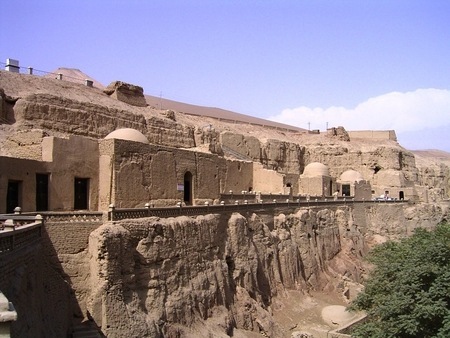 The following morning my local tour guide arrived to take me on a walking tour of Turpan. 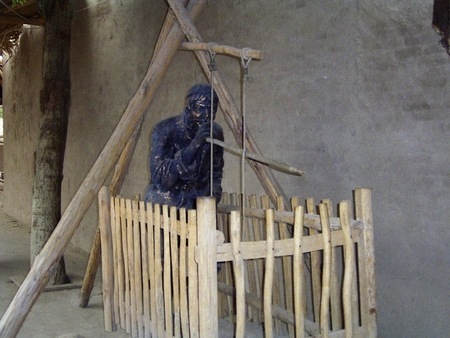 We went to the museum where there were more mummies – this time Chinese. It was interesting to see the ‘Silk Road’ history of Turpan as it had a long history as an oasis on the northern route of the Silk Road. It is a predominately Uighar city, with 70% of the people Uighar. He shared with me some of the social and political issues, but in a circumspect manner given the sensitivity of the Chinese government to dissent. He took me to the market which was a blast. Lots of people selling sheep so I thought of New Zealand. 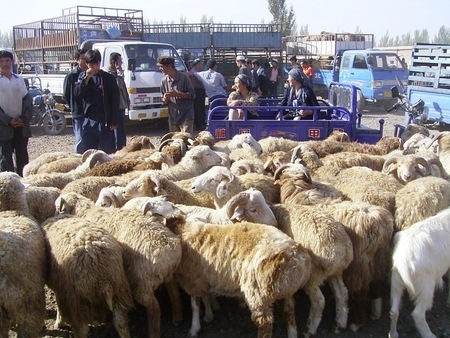 I was told of the huge price inflation with sheep which was making it difficult for some locals. 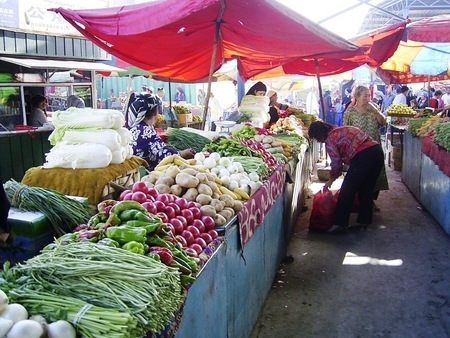 We then went over to the local market where they were selling fruit and vegetables. 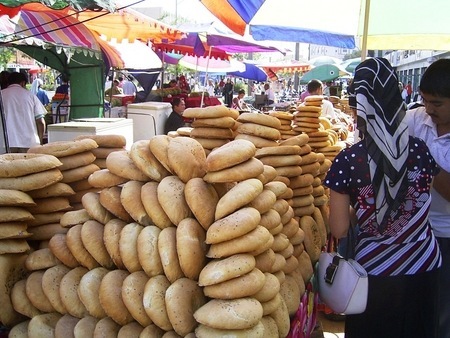 One thing which I really appreciated about Xinjiang was the bread. Everywhere I went there were people selling fresh bread for only a few cents a loaf. It was my main staple after several weeks of rice in the east of China. Time was running late and we went to the bus station. I caught the bust to Urumqi which was a fun experience. The people on board were very friendly and offered me water and food. As we travelled along it was very hot, with the sun coming in through the windows in spite of the curtains. 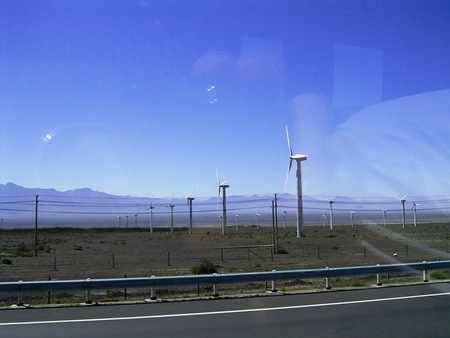 Along the way we passed a huge wind farm which is Asia’s largest. Given the intensity of the local winds I experienced the previous evening I’m sure they generate a lot of power! So ended a great visit to the Taklamakan. I must re-read Peter Hopkirk’s book again to remind myself more of the area’s fascinating history. In less than 100 years it has gone from unexplored desert to a major tourist area. This entry was posted on Tuesday, September 25th, 2007 at 11:14 am and is filed under Uncategorized. You can follow any responses to this entry through the RSS 2.0 feed. You can leave a response, or trackback from your own site.